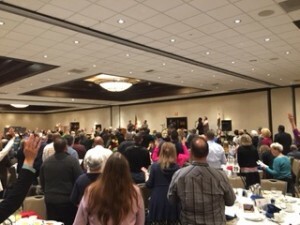 This year, I had the honor of attending the 23rd Annual Inland Empire Prayer Breakfast, a wonderful opportunity held every year to give back to the community in a faithful way. The power of prayer steps in as a way to shape our lives and revive our humanity, so I was rightfully blessed to be able to attend this wonderful meeting with many other people who believe in the beautiful power of prayer. Prayer is a wonderful tool used for protection and compassion on behalf of all leaders, law enforcement, public safety within the community, businesses, youth, and every other person living their lives, appreciating the world we live in, and working toward a better community. Many people have sacrificed themselves for a greater world to live, and we must pray in honor of who continue to do good every single day. 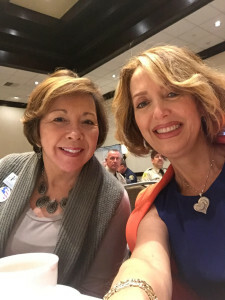 The Inland Empire Prayer Breakfast came about in 1993 as a way to combine the love of business, church, community, and political leaders who have volunteered their time and resources to provide an opportunity for God’s people. Through the prayer breakfast, many people are able to come together to publically pray for our region, state, and nation as well as getting to know one another to realize the importance of the body of believers as a whole. While they do this, they simultaneously create awareness of ministries and organizations in the area. On May 5, 2016, the 23th anniversary of the prayer breakfast took place at the DoubleTree Hotel in Ontario, where I, Soheila Azizi, was able to attend with many other likeminded individuals coming to appreciate their time and give thanks to the God who has given us so many opportunities in life. What started out as an initially small meeting turned into 400 attendees established, a spectacular amount. Every year at the Inland Empire Prayer Breakfast, a tradition enfolds involving pre-addressed postcards that go to non-attending local, regional, state, and national leaders acknowledging prayer for them. There is always a well-known speaker as well, and this year that speaker was Lou Engle himself. Lou is best known for his leadership of The Call, a program hosting twelve-hour prayer rallies. At the breakfast, Lou thankfully shared his extensive life experiences emphasizing the need for individuals, corporately and individually to return to the God of Fathers through the National Day of Prayer theme. Each year, the Inland Empire Prayer Breakfast welcomes all people who come of faith and good will. Luckily, I was able to join in the excitement of the occasion and meet others who appreciate one another and the day of Prayer that has gained importance in my life and many of the lives in the community. I am truly blessed for this opportunity.